Our solid lemon yellow pocket squares are a perfect color match to all of our Romario Manzini ties in the same color and provide added style and elegance. Golden Yellow pocket squares match our collection of solid lemon yellow ties. This lemon yellow colored hanky is a bright yellow. The material is satin finished with a medium amount of sheen, which means it does have some shine, which creates variation in the exact shade/brightness that is shown at any given moment, depending on the amount, type and angle of the light hitting the tie. If the exact shade of this bow tie is a concern, please read our color matching section to help. 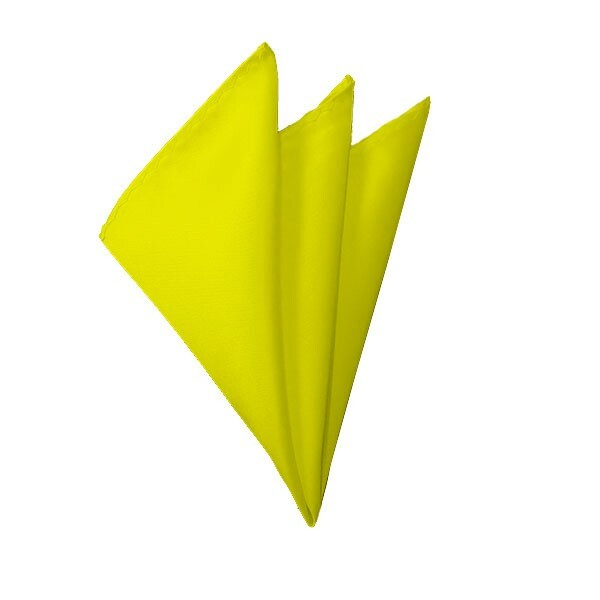 This lemon yellow handkerchief is a satin finished, 10 inch by 10 inch square with finished edges. Depending on your tastes, it can easily be folded into a 1, 2, 3 or 4 point handkerchief fold that would then slip into your pocket, with just the tips of the fold sticking out of your pocket.